Not a great forecast but 8 folk turned out to brave the elements although it turned out to be dry and positively warm! We walked over 6 miles along the banks of the Sixmilewater and then the northern shore of Lough Neagh through Rea s wood. We saw herons and a dipper and some lovely autumn woodlands. We had a wee picture taken on the Shakey bridge. Good chat, company and food was enjoyed by all! there was a steady mizzle it was not as bad as predicted and was quite mild. With little wind about all the umbrellas made it back in one piece and were safely stacked away as their owners tried out a new lunch venue at 'The Fort'. All agreed it was a very good lunch with nice surroundings. 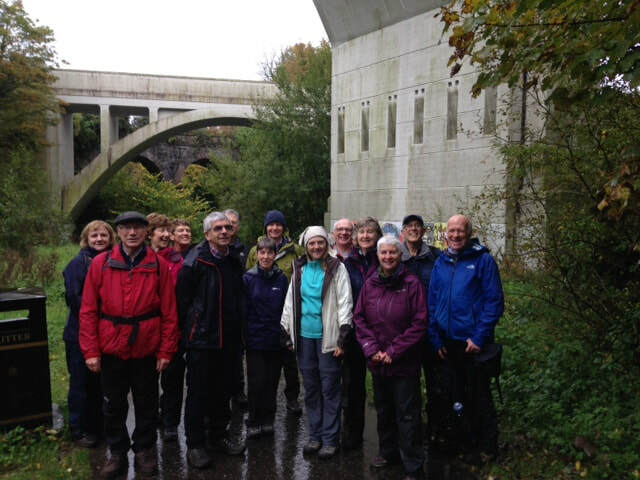 A group of 15 of us met at the Mossley Mill car park on a wet, but mild, autumnal morning- the weather forecasters had predicted dry conditions after rush hour but alas the rain continued until near midday. Thus the weatherproofs and brollies were much in evidence for the 3 mile walk down to the foreshore at Whiteabbey . We stopped briefly at the Bleachgreen Viaducts for the accompanying photograph. The walk back up again was a much drier affair, and we were better able to appreciate the autumnal colours and the rushing Three Mile Water river, swollen beyond it's normal level by all the rainfall. This small river once powered 7 mills in Victorian days on it's short journey to the sea. We returned to the car park at 1pm, a 2 hour walk averaging 3 mph and enjoyed a pleasant lunch at the Yarns restaurant in the Civic Centre. On a blustery but warm day 21 of us assembled in the car park for walk round the outer trails of the demesne. This included some newly opened trails which Richard Middleton, Red Sox member, who was in our party had helped to clear in previous months. At the start of the trails the attendant in the little gypsy type caravan was a little overwhelmed by our large group but he cheerfully read our NT cards or took the money and made sure we all had a map of the trails. We started with a gentle ascent of New HIll and then down through the trees to the ruins of the old piggery. The next part of the walk was one of the new trails which led through a particularly nice silver birch wood and then a fine avenue of beech trees. We then walked along beside pleasant stream and further woods which skirted the boundary of the estate.There was a swift uphill walk to the Temple of the Winds where today there was a non view of the Mournes. Moving quickly on we reached the car park just as it started to rain as the weather forecast said it would. Most of us retired to the NT café and enjoyed a nice lunch. Thanks to all for keeping up a good pace so we did not get wet. On a nice sunny morning and fortified by refreshments in Peter Morgan's Cottage 15 walkers set off up the Bridle paths which were a bit muddy in places. We proceeded through Drumkeeragh Forest and savoured the views and the sunshine. Some of us enjoyed a tasty lunch in Dromara village afterwards. A new season of Spartan Red Sox Wednesday morning walks kicked off on on August 30th with a walk that was a little more challenging than the usual format. Nine Red Sox assembled at Newcastle bus station to catch the 10.00 Mourne Rambler bus to Trassey Road, the objective being to return to Newcastle by means of the Brandy Pad. 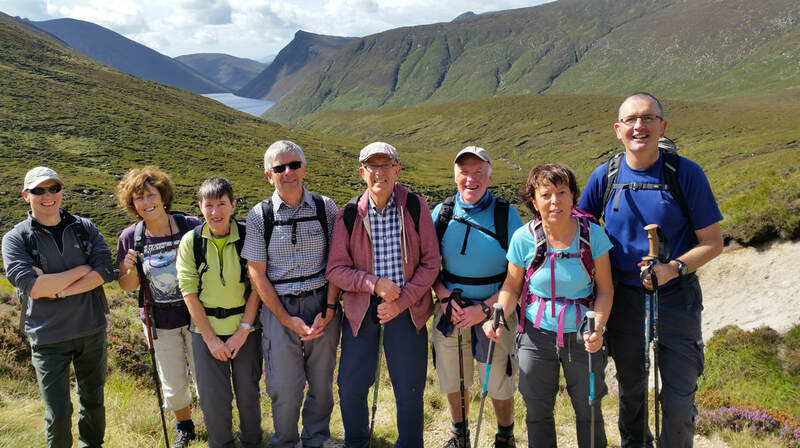 This was the penultimate day of operation for this year of the summer-only Ulsterbus Mourne Rambler, a sadly under-advertised and under-used service which should be of enormous appeal to walkers and tourists. More promotion needed, it offers so many options for those wanting to sample different areas of the Mournes. On a marvellously sunny morning, the countryside looked its best. After recent rain the visibility was outstanding and the entirely clear peaks were alluring. Having been left off by the bus at the end of Trassey Road, we hiked down the hill, across the attractive switchback bridge and up past the Trassey car park, passing there at 10.30am. After pausing to remove a layer, we headed up the Trassey Track. We made steady uphill progress, stopping occasionally to admire the scenery (AKA having a breather and a slug of water). First lunch was partaken of at around midday up at the Hare’s Gap, where we relaxed in the sunshine. Then it was on along the trusty Brandy Pad and into the Mournes amphitheatre where we marvelled at the 360 degree views of the familiar peaks. The Brandy Pad threads its way past the main ascets but it is not entirely flat, either. More energy was required to tackle the coll between Slieve Beg and Commedagh (1,800 ft) before we descended past The Castles and on up the now clearly defined track to the Saddle between Commedagh and Donard. At 1,920 ft this was effectively the summit of our hike and an appropriate place for second lunch. As we relaxed we could see a squad from NI Water busy repairing the famous Mourne Wall high up on the slopes of Commedagh. While we had had the Brandy Pad to ourselves, Donard was relatively busy with occasional groups of determined summiteers. After a suitable rest to take in the magnificent view down to Newcastle and to recharge our batteries it was time to head onward and downward. Again we met knots of walkers – locals and tourists – making their way up from Newcastle. Our destinations was Niki’s coffee house at Donard Park and by 3.30pm we were all savouring our afternoon tea – with some tempted to sample the legendary apple pie and ice cream along with their coffee. The final leg was along the seafront back to the car park at Percy French’s, after a challenging but hugely enjoyable day out, with the usual Spartans camaraderie and chat helping to keep us on the move. Although we seemed to have come a good distance, the GPS had recorded a rather meagre mileage of just under 7.5. Must get new batteries! And although we had already had our afternoon tea, the icing on the cake was the timing of the cloudburst which descended on Newcastle – it held off until just after we were all safely back into the cars and heading for home. Thanks to all those who helped get the autumn term off to such a good start. This was a more extensive examination than we usually undergo on a Wednesday morning but it does show that we can still rise to the challenge of a proper hill walk. Food for thought in the months to come! Given the rainy weather forecast I was surprised anyone turned up for the walk. However 6 other brave Spartans appeared & we set off uphill in the drizzle. The first part of the walk was through the wood so the rain did not bother us too much. When we reached the top path the rain had stopped & the clouds had lifted so we had a good view over Belfast Lough. So it turned out to be a pleasant walk after all! group of 17 of us met at the Divis Road car park on a lovely clear Spring morning- perfect for our walk. We set off up past the Long Barn, before taking a left on the "Tipperary" road towards the summit of Divis. Good views were enjoyed on this section , especially of Lough Neagh and the airport, but also beyond to the Sperrins. We continued to the summit,and to our first trig point of the day- apparently the first trig point used in the mapping of Ireland in 1825. We then made our way back down the asphalt road to join the boardwalk leading towards the Black Mountain summit where we stopped for an early al fresco lunch, beside the second trig point of the day. The views over Belfast and beyond were superb, and there was a lot of fun identifying familiar landmarks, buildings,roads etc. We then proceeded along the ridge to Black Hill , eventually crossing the Collin river and back on to the main path near the Long Barn, and hence back to the car park. 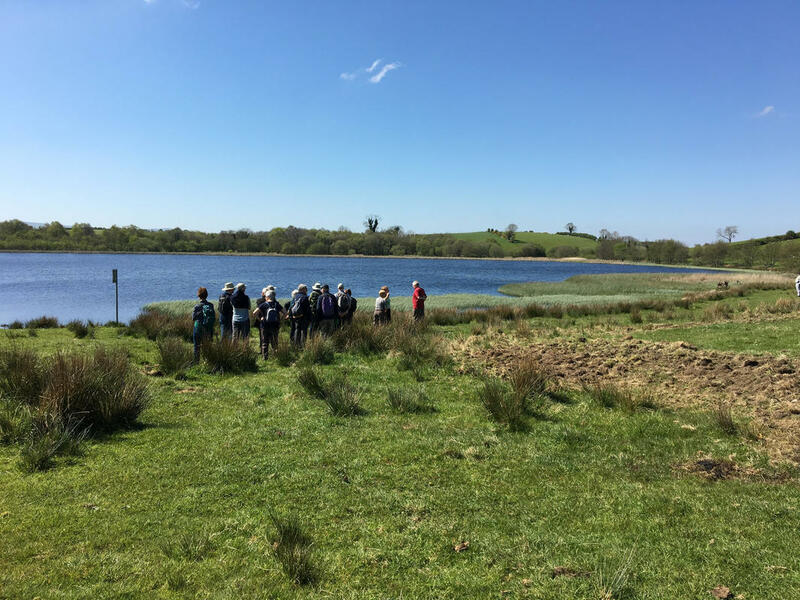 Wednesday 3rd May saw a group of 24 set off on a circular walk of 9.4 km from Ballyroney Church across Lackan Bog and round Hunshigo Lake. The weather was beautiful and even the bog was not too wet. The sight of a pair of Red Kites was a bonus. The walk finished with a picnic in the sunshine. 17 of us enjoyed sunshine and blue skies as we rambled through Randalstown and forest. We were greeted by pheasant calls and a buzzard flying overhead! We looked out over the Lough from the birdhide with only swans and ducks in view. Fallow deer were very visible close to the fence and some even crossed our path at one stage. Despite warnings of coastal gales and 70mph winds, 17 Red Sox gathered at Holywood railway station on January 11 for the first Wednesday walk of 2017. Our intention was to walk to Crawfordsburn Country Park for lunch at the Woodlands Cafe and then on to Carnalea to catch the train back to Holywood. Although there was indeed a strong wind (happily on our backs) and a high sea, it was a bright and dry morning. At least, that is, until we stepped onto the prom and found the waves crashing off the sea wall, sending sprays of foam and brine across the normally tranquil path. A short stop ensued as those who had brought them donned waterproof trousers and then it was best foot forward. On several occasions we had literally to dodge the puddles and run the gauntlet of sea spray. Few escaped a bit of a drenching, but it was a warmish wind and we soon dried out. The sea was at its majestic best and as the wind blew and the waves thundered in, we marvelled at the power of nature. Truly it was a privilege to see such a storm crashing in on the coast. We were intrigued by the sight of aircraft virtually motionless in the air as they battled against the stiff wind on the approach to City Airport. The birds did not have much more success. A flock of oyster-catchers that we disturbed on the shoreline struggled to get airborne and the flew only a few yards before flopping down again. Out at sea the ferries were making heavy weather of it, with the Cairnryan boat making painfully slow progress as it hugged the more sheltered Co. Antrim coast. We pitied the crew on board several freight ships lying at anchor at the entrance to Belfast Lough. Soon Helen's Bay beach hove into sight and as we turned the corner we got out of the wind and headed for Crawfordsburn. An earlier plan to visit the waterfall was abandoned and instead we all made a beeline for Woodlands Cafe where two tables had been set out for us. After our brisk two hour walk from Holywood, we were more than ready for lunch.The cafe, where the franchise has recently changed hands, did not disappoint. We relaxed over lunch and the chat around the tables was as lively as ever, as the affairs of the day were discussed. Although we left Woodlands at 1.35pm, and stepped out at a good pace, it was still a bit of a rush as we neared Carnalea station. The 14.02 train was spot on time and happily we all managed to clamber aboard and enjoy the train trip back to Holywood. Thanks to everyone for participating and being such good company. It was a memorable day!